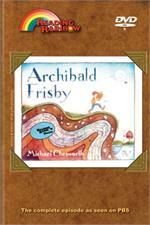 Archibald Frisby - Reading Rainbow DVD with LeVar Burton as seen on PBS and free teacher's guide. Reading Rainbow episodes offered here are designed to add another layer of learning to the classroom experience. Educational DVDs can reinforce lessons and further exemplify concepts taught during teacher instruction. The story of Archibald Frisby explores the world around us and answers questions about the way things work. Archibald gets his campmates involved in embracing a passion for science, even though he is supposed to be just having fun at camp. LeVar explores how science is a part of many everyday activities, such as riding a roller coaster. Viewers will also learn how Velcro was designed, how crash test dummies help auto designers, how studying weightlessness impacts the space program and how working with a biomechanist helps a high jumper improve her technique. As with all Reading Rainbow DVDs, Archibald Frisby enhances the standard curriculum. Here students can see science concepts in action, such as observation, trial and error, problem solving, estimation, comparison, measurement, and more. Find out what observation skills can teach us - LeVar rides a roller coaster and uses his observation skills to understand how they work. Then we see how the inventor of velcro used his observation skills to create a unique fastener. Crash test dummies and so much more - We see how the use of good observation skills can lead to better auto safety features, new inventions for astronauts and improved high jumping skills for an athlete.